The past couple of days have been frustrating. My blog was deactivated due to exceeding the SQL database limit, but wait it get’s even worse! After I was asked for an upgrade (disregarding the fact that it was a cost increase to maintain this blog from now on) which I performed, my blog was still deactivated which was eventually fixed after another upgrade after multiple phone calls to the technical support team. For the past three years, I have been working on this blog myself from blog design, learning about photography, “food styling”, researching which plugins to install to improve readers experience. For the first time in three years, I felt helpless and out of my dept. For the first time in three years, I decided to hire someone to fix the blog for me. When I thought of omelette, I thought of breakfast. With that being said, it is not unusual to have omelette for lunch and dinner. Unlike breakfast omelette, the omelettes I made for lunch and dinner tended to be packed with stronger flavours such as more onions, scallions, garlic or chilli. I have gone as far as adding chopped coriander! If you are familiar with oyster omelette in Malaysia, garlic, chilli and fresh coriander combination in an omelette will take you to the oyster omelette memory lane. On this post, I would like to share with you on how to add more fish in your diet with minimal fuss. Sometimes when I was not in the mood of handling raw fish, I relied pretty heavily on ready made smoked salmon fillets. 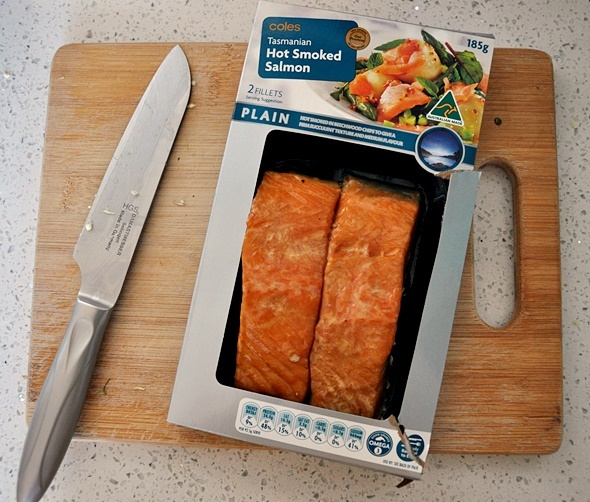 These were another option for people who dislike the taste of cooked fresh salmon. The added smokiness would dampen the “fishiness” a little. 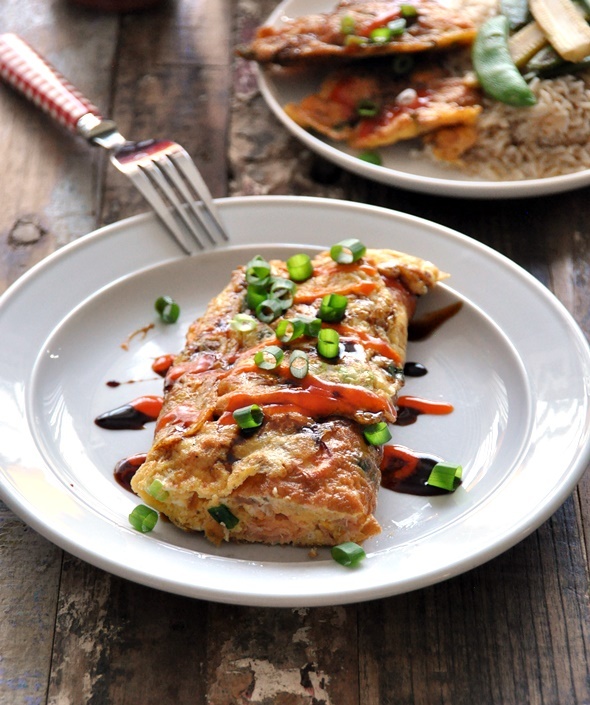 Adding smoked salmon into omelette may not be revolutionary but making into a meal with cooked brown rice, sautéed sugar snaps and baby sweet corns with a final drizzling of Indonesian sweet soy sauce, Sriracha and generous amount of chopped scallions may be. 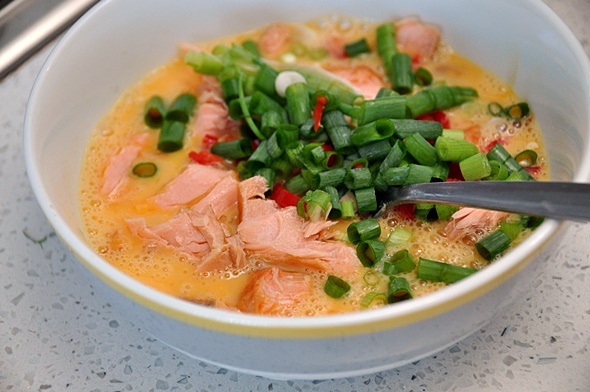 In a large bowl, add smoked salmon fillets, eggs, spring onions (saved a small handful for garnish later), red chilli, white pepper and 1/4 tsp of salt. Whisk gently until the ingredients are well combined. Set aside. In a large stir fry pan, add a teaspoon of cooking oil. 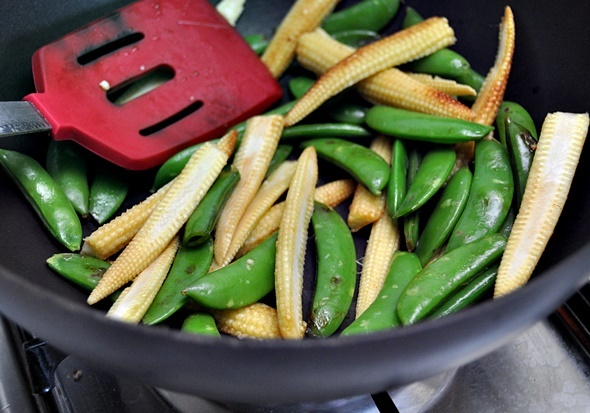 When the oil is hot, add sugar snap peas and sweet baby corns with a pinch of salt. Cover the pan for a minute or two, cooking until the vegetables are slightly wilted. Transfer the cooked vegetables from the pan to a plate and the cover with a cling wrap to keep warm. In the meantime, proceed to make the omelette. In the same pan, add a tbsp of cooking oil. When the oil is hot, add half of the egg mixture and cook over medium low heat, covered. 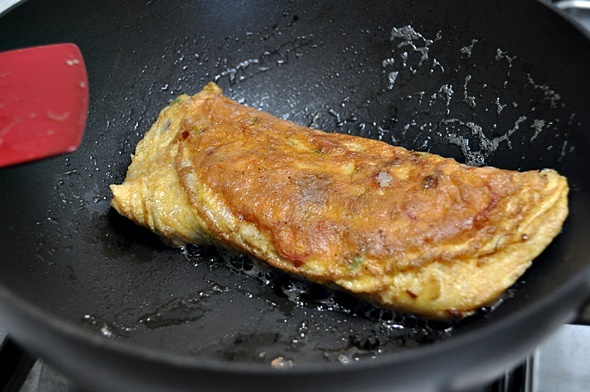 When the omelette is roughly 70% - 80% cooked, fold it in thirds, resembling a long pillow. Transfer to a separate plate and cover with aluminium foil to keep warm. Repeat the same with the remaining egg mixture. 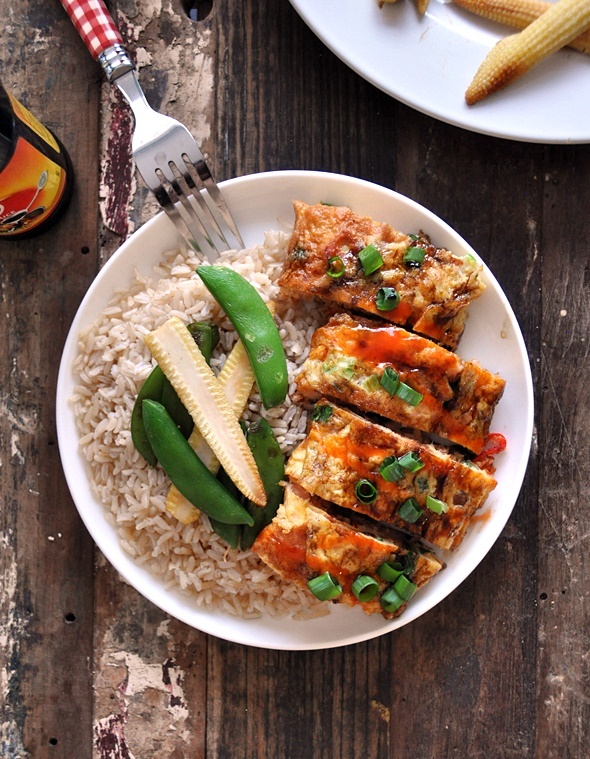 Divide the omelettes into 4 portions and serve with sauteed vegetables and warm bed of brown rice. As a finishing touch, drizzle Indonesian sweet soy sauce and Sriracha and a sprinkle of chopped spring onion. Salmon omelette??? That sounds like heaven! Such a neat little parcel. I love flaking hot smoked salmons into work lunches. Had that today!